After the war as DURING World War 2, a Q site, (night bombing decoy), in what was then Lancashire, was put into service. Near Formby at Downholland Moss the remains of control shelter for a Q site still stand today as well as many gunning emplacements all over the coast and around the airport. Q sites were night bombing decoys. This one was built to decoy RAF Woodvale further up the coast. The Q site itself was almost one and a half miles long and was intended to represent an airfield at night and consisted of a dummy flare path for landing aircraft and a v-shaped approach funnel. The shelter was normally situated within 400 metres of the decoy and housed 2 generators and rest area for the crew. There were normally 2 crew; one operated the headlight while the other kept watch. The shelter was covered with earth to protect it from near misses. The earth has now fallen away.other airfields were closed, Woodvale was to play another role with the RAF and was kept open. With the increase of air traffic from Liverpool Speke Airport (now John Lennon Airport) in 1951 Number 611 'West Lancashire' Squadron moved to Woodvale from Hooton Park, which was situated other side of the River Mersey. 611 Squadron conducted THUM (Temperature and Humidity) flights using the aircraft. In 1953 Manchester University Air Squadron moved its flying operations from Barton to Woodvale. 1957 the No 611 Squadron was disbanded and this also was the end of the operational service of the British legend, the Spitfire. The last one to fly in British military markings took of from Woodvale that same year. Things were changing at the air base and more none MOD operations were taking place and in 1965 on the 3rd October, RAF Woodvale held a Dragfest. Buddy Cortines won and posted the UK's first 200mph terminal speed. Buddy also recorded the fastest time of the '65 Dragfest with a 7.74/201. This stood as an unofficial UK record until 1970. In 1975 the Manchester University Air Squadron was renamed Manchester and Salford Universities Air Squadron in April of that year, to accommodate the new status of Salford University. Once again due to its increasing commercial air traffic at the now Liverpool John Lennon Airport, a great deal of research was carried out to find a new home for the Merseyside Police Air Support Group and RAF Woodvale was identified as the most suitable location in 1998/9. This marked a new era for the air field and in 2000 the Police force moved their helicopter Eurocopter Ecureuil 2 to a purpose built hanger at the airfield. 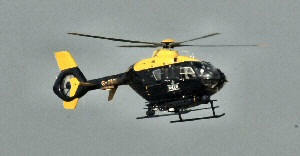 The latest Merseyside Police Air Support Group Helicopter at RAF Woodvale is a Eurocopter EC 135 helicopter. It was brought in to service in 2002 and uses the radio call sign XM11. This was also the privies helicopters call sign as both had been given the aircraft registration number starting G-XMII. As a result the chopper became known ever since as Mike One, by the force. In 2010 Merseyside Police put the warning out that it's The Air Support Group could be cut as part of the forces bid to cut millions from the national crime fighting bill. This came just after the National Police Air Service (NPAS) project team, that same year, recommended that Merseyside should loses its force helicopter and closes the Police section based at RAF Woodvale. This threat of axing the forces helicopter lead to many local residents to reacted angrily to the proposal put forward by the NPAS to save an estimated £15.3m a year nationally. In 2011 The confirmation was given the the Air Support Group was going to be axed. The History of 631 Volunteer Gliding Squadron was started out just a few miles away, on the river Mersey in in April 1944 as 186 Elementary Gliding School at Speke, is now official known as Liverpool John Lennon Airport. It moved to the other side of the river to Hooton Park in 1946 before being moved to Woodvale in December 1947. The Squadron was again moved in 1952 to Hawarden and renamed 631 Gliding School. In June 1963 the School was again it had to move, this time to RAF Sealand. In 1979 it as renamed 631 VGS, where it remained until the closure of RAF Sealand in March 2006, when the unit returned to RAF Woodvale. The move ended fears at the time, that RAF Woodvale cold have been closed under a spending review. By its 50th anniversary in 2011 of it's opening, the bases has had many changes from its designed role as a combat, airfield, built to protect the shipping lanes into the River Mersey and to protect Liverpool from enemy bombers. Now the site is operating in a new world and many changes are now taking place, but its original design purpose can still be seen if you look closely at the base and some surrounding buildings. Also in 2011 the base celebrated 40 years of a massive public show that takes place in and around the base called the Woodvale Rally. It stared in 1971 and has grown into one of the biggest events of it's type in the UK. To find out more about the event go to:- woodvalerally.com. 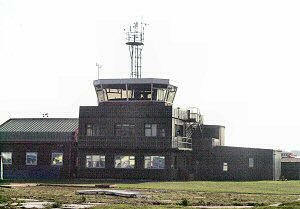 RAF Woodvale now has a small number of station staff of around 100. It's facilities now include a small gym that holds the basic equipment, personal fitness of its staff and that of the students. It also has a Station Mess. The station has had a few new buildings built since 2000 that includes an accommodation for students and some staff. A bar, classrooms, offices and equipment rooms, not forgetting a control tower, a basic fire station, 3 hangers, vehicle storage and other small utility buildings etc. The station is now playing a primary role in the UK's training of undergraduate student pilots via the Elementary Flying Training syllabus. Ex-UAS student pilots are then able to enter the RAF at a stage where they can be selected for fast jet, helicopter or multi-engine aircraft. The AEF provides air experience for air cadet members of the Air Training Corps and RAF sections of the College Cadet Force. RAF Woodvale currently has 5 active flying units based at RAF Woodvale:- Liverpool University Air Squadron, Manchester and Salford Universities Air Squadron, No 10 Air Experience Flight, No 631 Volunteer Gliding Squadron and the Merseyside Police Air Support Group.